i’ve been asked a lot about the whole “oily” side of the no-‘poo world. of course, the transition period will be oily and that’s unavoidable, but sometimes you just need a good ol dry shampoo, right? whoever created the concept of dry shampoo is a genius. pure genius. however, whoever decided that dry shampoo should be laden with chemicals is NOT. 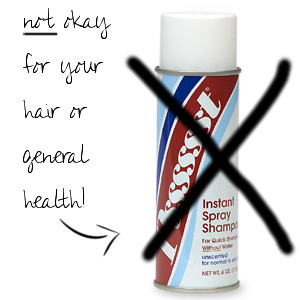 i’ve noticed the “pssst” dry shampoo has gotten pretty popular… well, i hate to break it to ya, but it’s rated a 6/10 on the EWG’s hazard scale for cosmetics, meaning it’s a moderate hazard (one point away from a high hazard actually) to your health! SCARY. the fragrance in it alone is rated an 8/10, high hazard! its other ingredients contain things like butane, propane, and aluminum… uhm, HELLO!! i just don’t understand how people knowingly pollute their bodies. i just don’t get it lol. that’s it! just mix, sprinkle it on in various places all over your scalp, and rub, rub, rub! easy peasy! scouts honor. i’d also suggest brushing right after to get some of the excess powder outta your hair. lemme know if you try it and how ya like it! honey & cinnamon cleanse… facts to back it up? Hi Alex, I am just starting No-poo, I actually ran out of shampoo about two weeks ago, and never used it again, my hair now is going through the transition period “yuck” but I get these awesome beach waves lol. I have washed my hair with baking soda once last week and then only water since then, only because I read about the PH in BS being so high and how it can damage the hair… my question is, is it still ok to use, for example this recipe that uses BS if its just sporadically? I would like to try this dry shampoo, but I am a celiac and cross reactive to corn and tapioca….no good putting it on my scalp! Do you have any suggestions for a sub for the corn starch? I use coconut flour in place of the corn starch and it works pretty well. What do you mean by “one part”? What are the measurements? Codi, if you’re mixing something that says “one part this” and “Two parts that”, that means that you can measure with whatever you want… if you’re using tablespoons, you can use one tablespoon for the one part, two tablespoons for the two parts, etc. It all comes out the same, and you can mix as little or as much as you want. It’s easier to measure in “parts” than in mixed measurements if you want to do a smaller or larger batch of something. What do you mean by “one part”? What are the actually measurements? meaning equal amounts. meaning one (cup, teaspoon, etc.) of______ and one (cup, teaspoon, etc.) of ______. it’s a ratio. i just started no-poo on Sat. on Sunday i had to do an egg wash because i was a little heavy handed with the argan oil and it was bad! i have been using my boar bristle brush and i can see it working, but last night (wedn) my hair looked like i had gone swimming, that is how greasy it was, so i just put some corn starch in, and wa-la! clean hair! so does that count as a wash? should i go another 3-4 days with out washing? i wanted to try a DIY aloe/honey wash for a good condition, but should i wait a few days? my hair has very low porosity, so putting oil on dry hair only makes it oily as my hair does not soak it up. Amazing stuff! And it smells yummy too. Thanks so much.